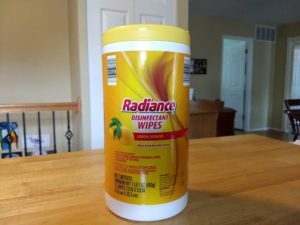 EDITOR’S NOTE: Updated March 2019 to reflect that Radiance Disinfectant Wipes have replaced the Freshine Disinfecting Wipes. Also updated to include new Radiance cleaning sprays. Aldi carries a small selection of household cleaning products, all near the laundry section of the store. I frequently use Aldi’s disinfecting wipes and their scrubbing sponges. Until recently, Aldi also carried a blue liquid window and glass cleaner similar to name-brand Windex, but I no longer see it in my local store. This product comes in a plastic bottle with 75 lemon-scented wipes that claim to kill the flu virus, including the pandemic 2009 H1N1 influenza virus. The wipes also claim to kill 99.9% of bacteria, are bleach free, and can be used for wiping away “everyday grease.” The wipes also are supposed to kill staph, salmonella, pseudomonas, and campylobacter. Active ingredients are octyl decyl dimethyl ammonium chloride, dioctyl dimethyl ammonium chloride, didecyl dimethyl ammonium chloride, and alkyl dimethyl benzyl ammonium chloride. Wipes can be used on tub and shower walls, phones, stovetops, doorknobs, kitchen counter tops, faucets and sinks, exterior toilet bowl surfaces, and on non-wooden outdoor patio furniture except cushions. I always keep a few containers of these wipes in my house, and I use them to clean toilets and to wipe down my bathroom floors (my bathrooms are so small that these wipes work better than trying to wrangle a mop around all the fixtures). In other parts of my home, I prefer to use spray cleaners so I’m not throwing lots of wipes in the trash, but I sometimes use these wipes to clean and disinfect my kitchen sink, to wipe down trash cans and waste baskets, and to clean my glass-topped patio table. To clean and deodorize, wipe surface with wipe and let air dry. Discard the used wipe in the trash, and do not flush wipes in the toilet. To clean and disinfect in a way that kills viruses, wipe a hard, nonporous surface with a wipe until the surface is visibly wet. Use enough wipes to keep surfaces visibly wet for four minutes, and then let air dry. If surfaces are extremely dirty, clean first with another wipe before disinfecting. Rinse food contact surfaces with clean potable water after disinfecting, and do not use the wipes to disinfect dishes, glassware, or utensils. To sanitize, wipe a hard, nonporous surface, using enough wipes to allow the surface to remain wet for 15 seconds. For plastic and painted surfaces, spot test on an inconspicuous area before use. The product claims not to harm most surfaces, including acrylic, sealed fiberglass, and vinyl. Do not use as a diaper wipe or for personal cleansing. The container states the wipes are “hazards to humans and domestic animals.” They can cause moderate eye irritation, and contact with eyes or clothing should be avoided. Wash with soap and water after handling wipes and before eating, drinking, or using the toilet. Basically, use common sense. These sprays clean as well as their name-brand counterparts. 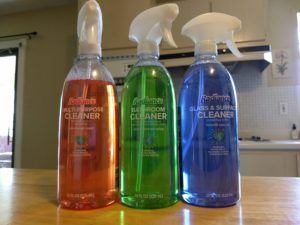 They have longer-lasting scents and don’t come in as many varieties of scents compared to Method cleaners, but they do the job. This is a name brand cleaning product. 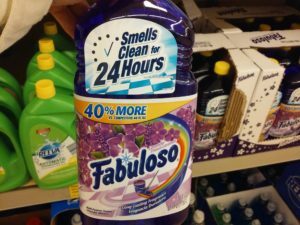 My local Aldi sells a 56-ounce bottle, and at the time I am writing this, Walmart’s website sells the same size bottle of Fabuloso at the exact same price as Aldi’s. This is a multi-purpose cleaner in a lavender scent. You can dilute it with water to clean floors, or put it on a sponge and clean bathrooms and walls. It claims to leave no residue and therefore needs no rinsing. My family has never used this product, but it is well reviewed by Walmart customers. These are little 4.44-inch by 2.6-inch sponges with two surfaces for scrubbing — a rougher side and a smoother side. They come in a 3-pack and are useful for cleaning bathrooms, kitchen counters, messy pots and pans, or whatever needs a good dose of elbow grease. I keep a couple of these around the house, especially for scrubbing tubs, showers, and sinks. They are non-scractch, made with 100% natural cellulose, with Acti-Pur Bacteriostatic to inhibit bacterial odors. They can be sterilized by boiling. This also falls under the laundry product category, but if you’re into cleaning with bleach, it’s here for you. I have not used it as a cleaning product in my own home. While not officially a cleaning product, you can pick this up in the condiment section and make your own natural, safe cleaning products. Even better if you pick up a box or two of Baker’s Corner baking soda in Aldi’s baking aisle. 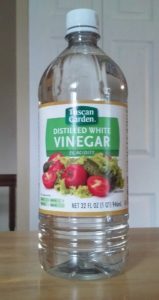 Aldi sells this vinegar in both large and small bottles, depending on your needs. Aldi’s cleaning product line is small but not insignificant. The Radiance Disinfectant Wipes and Freshine Non-Scratch Scrubbing Sponges are highly recommended, and so are the Radiance cleaning sprays that work like name-brand Method cleaners. The Fabuloso multi-purpose cleaner is a name-brand item that is well reviewed by Walmart customers. 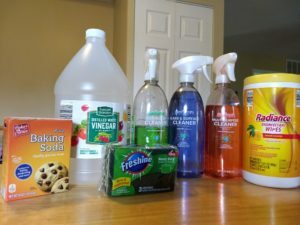 There’s also Tandil Bleach if you want to really get things clean, or simply pick up some Tuscan Garden Distilled White Vinegar from the condiments aisle and some baking soda from the baking aisle to make your own natural cleaning products. Baker's Corner, Fabuloso, Freshine, Radiance, Tandil, Tuscan Garden. Bookmark. Can you send me the Freshine Disenfecting Wipes Safety DataSheet please? Can just be emailed. Thanks. Anna, we’ve updated this post to include the precautionary statements printed on the disinfecting wipes container. 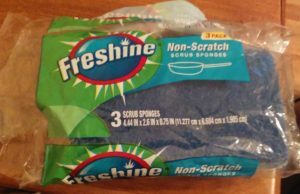 We have bought the Freshine non-scratch scrub sponges for a long time. The new and improved sponges dark blue side turns white and falls apart in clumps in a few days and you have these white clumps all over that don’t scrub off anything but more white clumps. Please go back to the old scrub sponge.